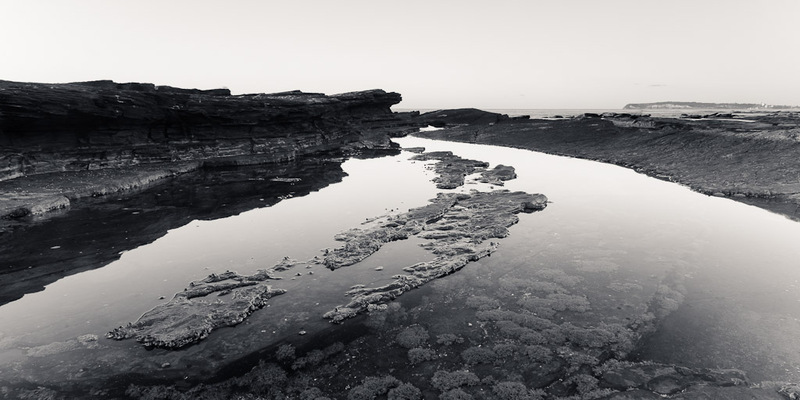 I joined the FOCUS (NSW – Seascape & Landscape Photography) crew for a dawn and sunrise shoot at Long Reef at Collaroy on Sydney’s northern beaches. Sunrise was at 6:04AM so it was an early 5AM meet at the Long Reef Golf Club (which meant getting up at 3:50AM :(). It was then a 15 minute walk around and down onto the reef in the pre dawn darkness. Even at this time and from on top of the headland above the reef you could tell there were basically no clouds in the sky so a spectacular colour filled clouded sunrise was not going to be on the cards. I decided to go with a bit of light painting on the reef which thankfully was near low tide leaving the whole shelf relatively exposed with just a shallow layer of water on the surface providing a mirror for the sky. 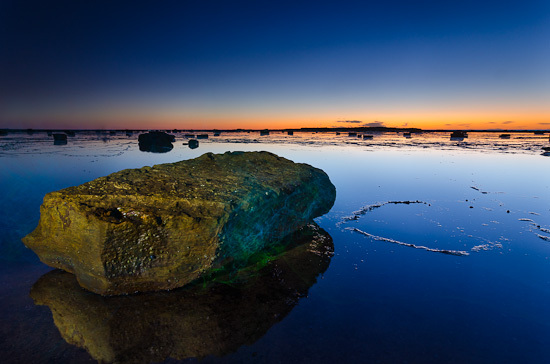 All I needed to do was find some suitable foreground interest with a good angle on the reef and sky – I found myself a relatively large undisturbed lake of water with just a single large rock in it and set to work. This was at 5:29AM, so just over 30 minutes before sunrise, which allowed me a long enough exposure (150 seconds) to do some light painting. Shot with a circular polariser and a 3 stop hard ND grad over the sky. I lit this rock using a focused beam from a small (but powerful) LED torch I’d recently purchased for this type of work (it’s powered by a single AA battery but puts out a lot of light (a couple hundred lumens) and is focusable). I lit the rock from the left side leaving the right in more shadow and then I used some blue and green EL (electroluminescent) wire to add some cosmic fire predominantly on the right and lapping up and over onto the top. Headed back into the centre of the reef and this area of very shallow still water, the reflections and the barely exposed rock caught my eye. I tried about half a dozen different angles on this from both sides but in post processing I came back to this which was my first shot :). It looked pretty rubbish in colour but in monochrome you can see just the shapes and tones which originally caught my eye.